I'm well aware that this title is making some pretty big claims but hear me out. I'm a sucker for "self-help" books and I love reading blog posts and articles about a simple, happy, healthy lifestyle. Over time, I feel like I've started to develop a few routines that help make my days a little easier which in turn makes me happier. I'm also a quarter of the way through Gretchen Rubin's new book, Better Than Before (she also wrote The Happiness Project which I read just after college). Her book is fascinating and it inspired me to write this post! 1 // Decide on your outfit while in the shower or before you get out of bed. This may sound ridiculous or frivolous but for a long time I've had this little rule for myself and it really helped me have a happier morning. There is nothing worse than standing in front of your closet, clueless with what to wear and becoming totally frustrated. Instead, I picture my closet, check the weather, and come up with an outfit while I'm showering/waking up. By the time I'm ready to get dressed, all I have to do is grab and go! 2 // Keep things where you can see them. Whether this is clothes, office supplies, linens, bathroom products, beauty samples...whatever it is, where it where you can see it. This means using clear plastic storage, maximizing countertop space, or strategically folding clothes in drawers. Being able to see what you own will not only make finding things easier, but you'll reduce the risk of repurchasing something you can't find. 3 // Strategically de-clutter and reduce the "things" in your life. If you've been hanging around these parts for awhile, you'll know that I'm a huge advocate for letting go of things you don't like or aren't using. But throwing stuff away can feel frustrating especially if you spent a lot of money. That money you originally spent is now a sunk cost, so if it's not enriching you're life, let it go. You can make the "blow" easier by selling items in a variety of ways such as Twice, GlamBot (for used makeup! ), Craigslist, and eBay. 4 // Move for at least 20 minutes a day. Ever since getting a FitBit, I'm insanely aware of how little I move on a daily basis when I don't actively think about it. You probably know this but getting your heart rate up has several mood-boosting and health benefits. Take the stairs. Walk while you're on a conference call. Use the FitStar app to do a quick workout routine or yoga session. Or try the Nike Training Club app. Or the 7-minute workout. Bike/walk to work. Jog with your dog or a friend. Just get your blood pumping at least once a day. 5 // Prep lunches for the week on Sunday. I think I've said this here before but I don't love lunch foods (salads, cold cuts, leftovers etc). But if I don't think about lunches for the week, I end up scarfing down whatever snacks are around the office which are NOT healthy. Things go much smoother when I prepare my lunches for the week on Sunday. I'll make salads in a jar, chicken salad, soup, chili, whatever sorts of things will last and are easy to transport. I have a MUCH better day when I'm actually looking forward to lunch! 6 // Create a shared google calendar. This applies to people with spouses or families and it's proved to be really useful in our household. Instead of constantly reminding each other of events or needing to check C's schedule before agreeing to something, I can just log into his google calendar and see what's coming up. It's one key to a happy marriage! 7 // Read something for 30 minutes before bed. You've probably heard this one 100 times but this is such a key to winding down for the evening and getting "ready for bed". It calms your mind and also provides critical "me" time. I got really out of the habit of doing this and I think my sleep really started to suffer. 8 // Keep a notebook next to your bed for the evening brain dump. Last night my mind was racing before bed. I did my reading but for whatever reason I could not shut my mind off. Instead of just lying there battling with myself, I grabbed my notebook and jotted down all the thoughts running through my head. About fifteen minutes later, I was gently drifting to sleep. Hopefully some of these things will work for you. 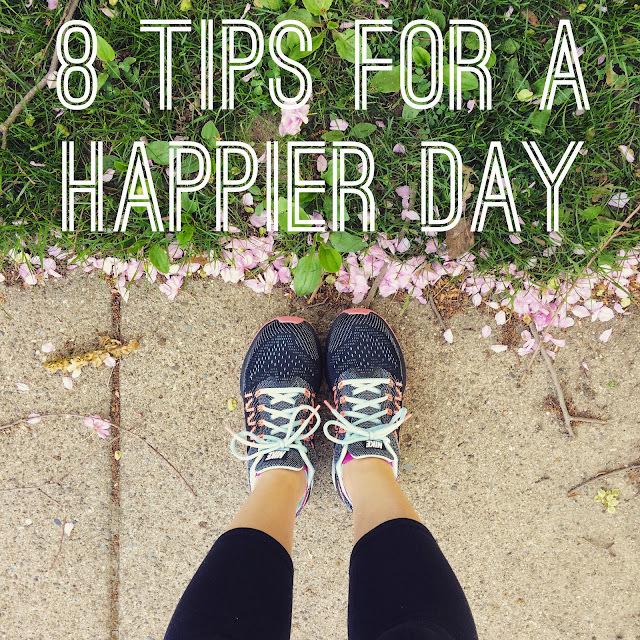 I'd also love to know - what things do you do to make your days happier and more simplified? Let me know!